I find trees as an highly important aspect of my Hearth Witchery, knowing your local trees and what they meant to those before you? So I will gather some information from dictionaries, my norwegian sources and some from the internet. Mind you this may be rewritten by me, but you can easily find it in a library book or if you know what to search for. In older times there was many areas who each spring commonly took warnings from the Ash. If The Ash turned green early, it would be a short summer. A popular weather prophecy for the summer goes like this: "Ash before Oak gives sallow, Oak before Ash gives a splash"
The Folk beliefs in the Ash's healing abilities against sickness have at times been very strong. As late as the early 1970's leaves and ash wood was cooked "out" into a kind of broth as an attempt to cure cancer, though this has never been proven to have any effect. The Ash was a sacred chieftain tree, believed to "Court The Flash" since it was prone to be struck by lightning. The wood of the Ash was thought of to be enchanted and was used by Druids to fashion wands and spears. Its twigs were placed in circles as a protection from snakes, witches would use the timber as handles for their broomsticks. Children would be passed through the branches of an Ash in order that they might be protected and to cure them from illness. 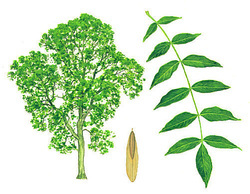 Ash leaves were placed under pillows to induce prophetic dreams or placed in bowls of water to ward off ailments. The Celts believed that the Ash originated in the Great Deep or The Undersea Land of Tethys. It belongs to the trilogy of sacred Irish trees (The other two being The Oak and The Hawthorn) and is said to offer protection from death by drowning. The seeds of the Ash have for a long time been used in love divination. If the seeds did not appear on a certain tree, then its owner was thought to have been unlucky in love or a future venture would be unsuccessful. In Northern England, it was once believed that if a woman placed an Ash leaf in her left shoe, then she would be fortunate enough, to immediately meet her future spouse. In Greece The Ash was sacred to the Sea God Poseidon and in Ancient Wales and Ireland, oars were made of this wood. The shade of this tree is said to be harmful to plants because its roots will strangle other roots. The Ash of the Ogham alphabet is the Cosmic Ash, also known as the World Tree. It appeared in Norse Mythology as Yggdrasil (Many argue what tree Yggdrasil was made of some say Ash, Others argue with Yew due to its more tangled roots), the tree of Odin/Wodan/Wotan/Woden who hung upside down from its branches to gain enlightenment to learn the secret of the Runes. Gwydion the Celtic equivalent of this Norse God, was known to choose the thick, strong twigs of the Ash for his wands and was renowned for his magical abilities. The Ash has roots which deeply penetrate the soil , souring the ground and making it difficult for other vegetation to grow beneath it. The wood of the Ash is though and pliable and often used in weavers beams. This tree was indicative of the linking between the inner and outer worlds. In Norse legend it was an Ash (or Yew) that spun the Universe with its roots in Hel (Norse Underworld, also the name of the goddess of death ) and its boughs supporting the Heavens and Earth at its center. In Celtic lore the Ash connected the three circles of existence Abred, Gwynedd and Ceugant which may be interpreted as The Past, The Present and The Future, or as Confusion, Balance and Creative Force. There was no Hell in Celtic beliefs only continual rebirth as passage was made from circle to circle until the Land of the Blessed was finally reached. 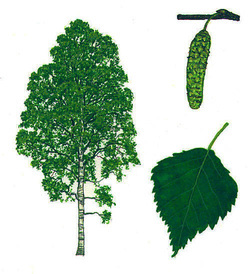 Any tree or shrub belonging to the genus Alnus, of the birch family, growing in moist places in northern temperate or colder regions and having toothed, simple leaves and flowers in catkins. According to norse folk medicine one could lay Alder leaves in the shoes to prevent sore feet and foot sweat. Trøndelag (A county in Norway) the inner most layer of the bark was dried, pulverised and strewn over fire burns. 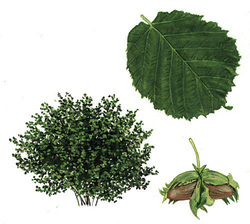 The Alder was believed by the Druids to link both male and female principles, thus helping to create a balance between the two within each individual. It is also associated with courage and represents evolving spirit. Considered to be a tree of death and resurrection, it may have been used (along with Poplar) in the fe rod which was kept in pre- Christian cemeteries for the measuring of graves and corpses. The fe rod was only handled by an appointed official and was believed to have been carved with an Ogham inscription. Resistant to the rotting element of water, wood from the Alder was often used in making bridges, boats, clogs and milk jugs. It was also frequently used in the making of magical whistles, flutes and pipes. It was once a crime to fell an Alder since the angry tree spirit was believed to burn down houses. If felled however, the tree literally "bleeds" by turning from white to red. 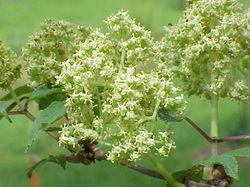 Red dyes were once made from the bark, brown dye from the twigs and green dye from the flower of this tree. Any tree or shrub of the genus Betula, compromising species with a smooth, laminated outer bark and closed grained wood. The Birch Bark is rich in tannin, which was used for tanning a process to create leather from animal skins. The outer bark layer have been used to lay out roofs on houses and outhouses, baskets,hats, drinking cones, bags and shoes can also be made out of birch bark. In older times in some areas people made something called "birch oil" extracted from the bark to use as medicine on sick animals. Some attribute the birch tree to Thor/Thunin/Tor from the Norse Pantheon, because some said that if a birch tree had been struck by lightning it was Tor who had blessed it and those who lived close to the birch tree would be protected. To The Druids, The Birch (often referred to as "The Lady Of The Woods" due to its grace and beauty) represented renewal, rebirth and inception, since it was the first tree to come into leaf after the Winter Season. The Birch along with the Elder were said to stand on either side the one "Nameless Day" (December 23rd). This slender but determined tree, which represented the seed potential of all growth, is hardier than even the Mighty Oak and will thrive in places where the Oak will fail to flourish. It also signifies cleanliness and purity. The Birch once fulfilled many purposes, from providing handles to brooms and axes to the manufacture of cloth and childrens cradles. It is particuarly well known for its use in making writing parchment and oil from the bark was often used to treat skin conditions and depressions. People were once "birched" in order to drive out evil spirits, while twigs were given to newlyweds to ensure fertility. Witches would use Birch twigs bound with Ash for their broomsticks or "besoms." Birch has been known to cure muscular pains and the sap used in the manufacture of wine, beer and vinegar. It is the rod of a Birch that Robin Red Breast used to slay the Wren in a furze or gorse bush on Saint Stephen's Day. In Wales the Birch is a tree of love and wreaths of Birch are woven as love tokens. Its trunk was formerly used to make the traditional maypole (Spring Equinox celebration Also known as Beltane/Beltaine in some circles of spirituality) and boughs were hung over cradles and carriages to protect infants from the glamour of The Little People. The European mountain Ash, Sorbus aucuparia, having pinnate leaves and clusters of bright red berries. If you look at the bottom of these berries they have a five pointed star or pentagram as some know it as. 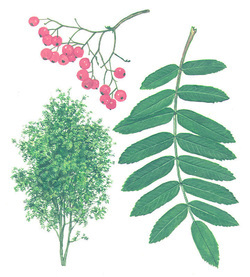 Twigs, branches and bark of Rowan was used as cattle feed back in the old days. In Folk medicine (Northern European) Rowan was used to ease Rheumatoid arthritis and as a little bit help to the bladder, so the urine would become better. In cooking. Rowan berries have been used to make Jam, Jello (Marmalade) wine and liqueur. This tree was also believed to guard the gateway to the spirit world and its boughs often used for dowsing and deflecting spells. The Rowan is sometimes called the "Whispering Tree" an ancient legend tells that it has secrets to reveal for those who would listen. The Rowan has been Associated throughout history with protection against wickedness and is believed to be the wood which was used to engrave Norse Runes. Its name is linked with the old norse Runa/Runer that translates to "charm" "protection" "secret". It is also associated with the Sanskrit "Runall" meaning "magician". The Cornish and Scots would carry an equal sided cross of Rowan to protect them from harm and wands were often placed over doorways to houses in order to ensure good fortune . In Wales, Rowans used to be planted in churchyards so that they might watch over the dead. The Rowan, a tree of protection and insights, was known to be a tree belonging to The Faery. Its wood was frequently used for bows , favored secondly only to Yew for this purpose. When sliced in two the orange/red berries Rowan berry reveals a pentagram symbol for protection. Thus, this tree was believed to possess the ability to protect from enchantment and trickery. It was once thought that the rowan berries were so sacred that the Gods guarded them jealously and kept them from humankind. 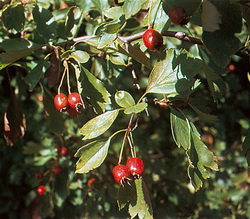 The Rowan was also believed to enhance strength with courage. The Ancient Druids would light fires of Rowan to help induce insights as to how a battle might progress and to invite the Faery Folk of the Sidhe to fight along side them, thus lending aid in the fray. 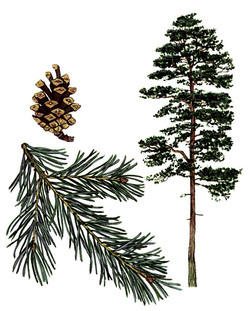 Any evergreen,coniferous tree of the genus Pinus, having long, needle - shaped leaves, certain species of which yield timber, turpentine, tar, pitch etc. For Centuries in Scandinavia, pine branches have been used as protection and to ward off negative entities from their homes. Simply by laying pine branches on their doorstep, or close to the threshold. Pine needle oil is a must I believe in a home. It can extract puss and bacteria from the irritated area be it an accidental nail clipping, or if you have an itching mosquito bite, or did you just get blemishes from a nettle? A good soaking in pine needle oil is the perfect. It helps wounds to grow faster, and even professional doctors in my country recomend it as a remedy for certain ailments. Warning* Those of you who are allergic DO NOT USE THIS. No need in risking it either.